Venus, the Greek Aphrodite, one of the most celebrated deities of the ancients. She was the goddess of beauty, the mother of love, the queen of laughter, the mistress of the graces and of pleasures, and the patroness of courtesans. 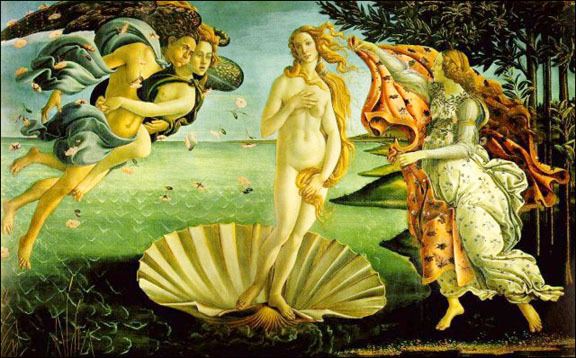 Some mythologists speak of more than one Venus. Plato mentions two Venus Urania the daughter of Uranus, and Venus Popularia the daughter of Jupiter and Dione. Cicero speaks of four, a daughter of Coelus and Light, one sprung from the froth of the sea, a third, daughter of Jupiter and the Nereid Dione, and a fourth born at Tyre, and the same as the Astarte of the Syrians. Of these, however, the Venus sprung from the froth of the sea, after the mutilated part of the body of Uranus had been thrown there by Saturn, is the most known, and of her in particular ancient mythologists, as well as painters, make mention. She arose from the sea near the island of Cyprus, or, according to Hesiod, of Cythera, whither she was wafted by the zephyrs, and received on the seashore by the seasons, daughters of Jupiter and Themis. She was soon after carried to heaven, where al the gods admired her beauty, and all the goddesses became jealous of her personal charms. Jupiter attempted to gain her affections and even wished to offer her violence, but Venus refused, and the god, to punish her obstinacy, gave her in marriage to his deformed son Vulcan. This marriage did not prevent the goddess of Love from gratifying her favorite passions and she defiled her husband's bed by her amours with the gods. Her intrigue with Mars is the most celebrated. She was caught in her lover's arms, and exposed to the ridicule and laughter of all the gods. Venus became mother of Hermione, Cupid, and Anteros by Mars; by Mercury she had Hermaphroditus; by Bacchus, Priapus; and by Neptune, Eryx. Her great partiality for Adonis made her abandon the seats of Olympus, and her regard for Anchises obliged her often to visit the woods and solitary retreats of Mount Ida. The power of Venus over the heart was supported and assisted by a celebrated girdle, called zone by the Greeks, and cestus by the Latins. The mysterious girdle gave beauty, grace, and elegance, when worn even by the most deformed; and it excited love and rekindled extinguished flames. Juno herself was indebted to this powerful ornament to win the favors of Jupiter, and Venus, though herself possessed of every charm, no sooner put on her cestus, than Vulcan, unable to resist the influence of love, forgot all the intrigues and infidelities of his wife, and fabricated arms even for her illegitimate children. The contest of Venus (Aphrodite) for the golden apple of Discord is well known. She gained the prize over Pallas (Athena) and Juno (Hera), and rewarded her impartial judge (Paris) with the hand of the fairest woman in the world (Helen of Troy). The worship of Venus was universally established; statues and temples were erected to her inevery kingdom, and the ancients were fond of paying homage to a divinity who presided over generation, and by whose influence alone mankind existed. The rose, the myrtle, and the apple, were sacred to Venus; and among birds, the dove, the swan, and the sparrow, were her favorites; and among fishes, those called the aphya and the lycostomus. The goddess of beauty was represented among the ancients in different forms. At Elis, she appeared seated on a goat, with one foot resting on a tortoise. At Sparta and Cythera, she was represented armed like Minerva (Athena), and sometimes wearing chains on her feet. In the temple of Jupiter Olympius, she was represented by Phidias as rising from the sea, received by love, and crowned by the goddess of persuasion. Her statue at Cnidos by Praxiteles, represented her naked, with one hand hiding what modesty keeps concealed. Her statue at Elephantis was the same, with only a naked Cupid by her side. In Sicyon she held a poppy in one hand, and in the other an apple, while on her head she had a crown, which terminated in a point to intimate the pole. she is generally represented with her son Cupid, on a chariot drawn by doves, or at other times by swans and sparrows. As goddess of the sea, born in the bosom of the waters, Venus was called Pontia, Marina, Limnesia, Epipontia, Pelagia, Saligenia, Pontogenia, Aligena, Thalassia, etc., and as rising from the sea, the name of Anadyomene is applied to her, and rendered immortal by the celebrated painting of Apelles, which represented her as issuing from the bosom of the waves, and wringing her tresses on her shoulder. The planet Venus was called by the Greeks Phosphorus, and by the Latins Lucifer, when it rises before the Sun, but when it follows it, Hesperus or Vesper (Cicero, Nat. D. 2, c. 20. Somn. Scipio).